When I went to Greenpoint Fish & Lobster to buy a mackerel, they had razor clams so I had to get some! Usually I would saute them with garlic, but I kept picturing them as a ceviche with the ramps I had gotten earlier that morning from the Union Square Greenmarket (first ramps of the season that day). I blanched them (four clams) quickly to get the shells open so I could clean them. I cut them into half inch long pieces and marinated them in a mixture of lime juice and yuzu juice (100% Kitagawamura yuzu juice with no salt) for about 20 minutes. There should be enough citrus juice to cover the razor clam pieces. In the mean time, I charred the ramps whole, in a saute pan, and drizzled some yuzu kosho vinaigrette over it to cool it down. Mix the red onion, yuzu kosho and yuzu juice together until the yuzu kosho is well combined (remove any clumps). Drizzle in the sesame oil and whisk together until emulsified. Add the chili flakes. Season with salt and pepper if necessary. After the razor clams have marinated for at least 20 minutes, season it with salt and pepper. 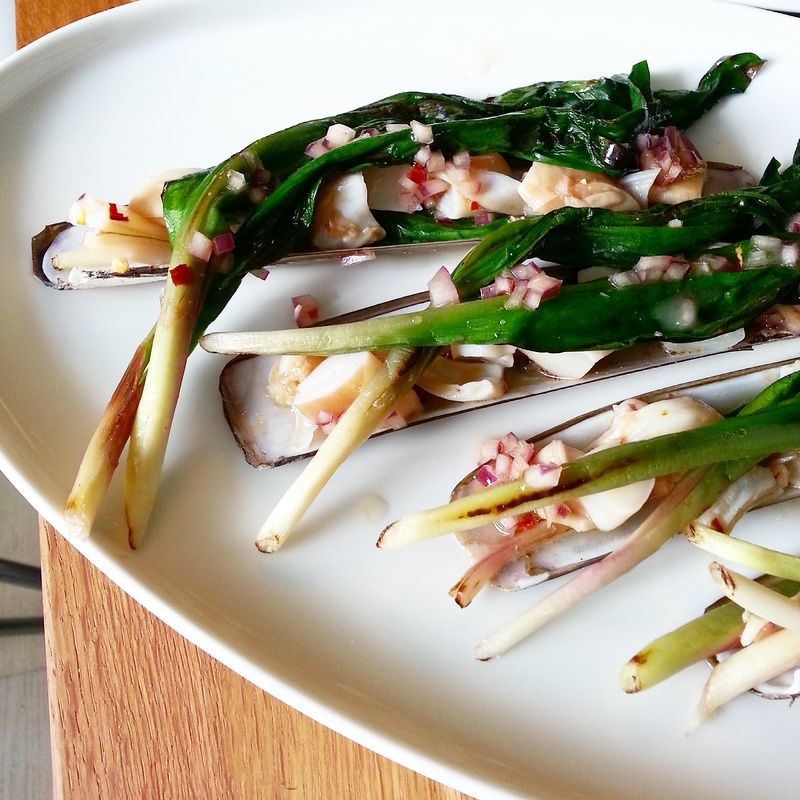 Plate them onto the razor clam shells, place the ramps over them, and finish with the yuzu kosho vinaigrette.